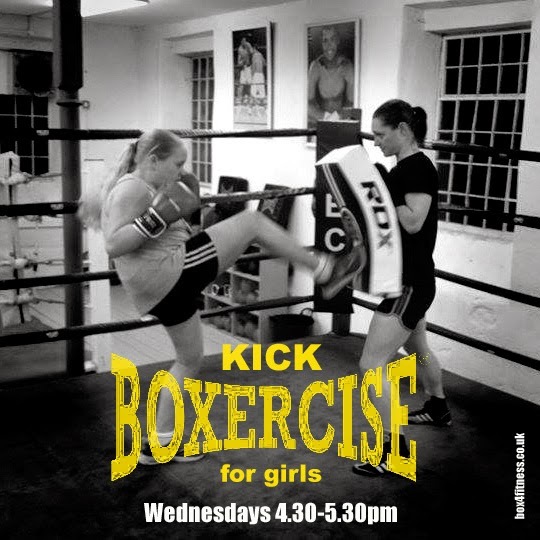 We had a successful Kickboxercise taster session just before the holidays so will be starting regular classes for girls as from next Wednesday, 15 April. Based on martial arts, this is a non-contact form of exercise that teaches punches, kicks, elbow strikes, knee strikes and combinations of them all with relevant defences. We don't just punch and kick the air in these training sessions, we use strike shields, punch bags and focus pads to safely and effectively teach and practice technique at full power and speed. What are the benefits for girls? Increased confidence and self esteem through learning and developing a new skill. Enhanced body awareness and physical capability, together with improved body image. We encourage strength and ability over looks and shape. Improved confidence at school, on the street and amongst friends; developed through an ability to better protect and defend themselves. Decreased anger and self control issues through the practice and training. An enhanced circle of friends from other schools and communities. £30 for 8 sessions, £40 for 12 sessions or £5 per class for drop in. There will be 3 or 4 assessments held per year where girls can work towards achieving their Level 1, 2 and 3 Box 4 Fitness Award. They will receive a certificate, medal and pair of coloured handwraps when they pass their assessment. Each level gives them a certain amount of responsibility in the gym and during training sessions. We work with the girls to enhance their leadership and confidence through this programme. Rhea Carsmith, qualified and registered Kickboxercise Instructor, DBS checked and insured. Under guidance of Head Instructor Kate Dakers, England Boxing Coach and Child Welfare and Safety Officer for Hebden Bridge Boxing Club. When: Wednedays 4.30-5.30pm from 15 April.